The gears are turning. Volunteers submitted the Administrative Special Use Permit (ASUP) last week. They've established policies and are currently gathering potential vendors and working out details of how the market will be run. It seems like the time to announce the newest Alexandria Farmers Market. 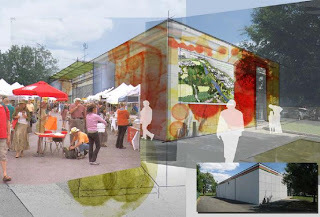 Pending approval, which seems imminent based on community and City staff feedback so far, the 4 Mile Run Farmers and Artisans Market should be a reality within a month or so. The Market will be open from 8am - 1pm on Sundays starting early this summer. Pending completion of all preparations, the first market day should be June 20th. If you'd like to help prep the site this Saturday, May 29th, a group of volunteers will meet at the old Duron Building (and eventual Community building) to tidy up the site from 10am to noon (meet at 4109 Mt. Vernon Ave). We need all the help we can get to weed, prune trees and bushes, and generally clean up the space in preparation for the Market. With the following Market mission statement settled upon, hopefully the market will be a solidifying element within the community: "The Market will bring fresh, nutritious food to people of all income levels, provide an opportunity for local artisans and producers of goods to bring their wares to market, strive to reflect the diversity of the community, and improve the quality of life for Arlandria residents and visitors." The Market will strive to operate to in accordance with its stated mission. First year Market goals include getting the market running by end of June with at least 5 vendors, improving and maintaining the expanded 4MR park site, and supporting EBT or WIC payment by end of the first market year. This could be a very exciting year for building community within Arlandria. If you know a local artisan or a farmer in the region, are an artisan or farmer looking for a place to sell your wares, or are an area resident that wants to get involved with the Farmers and Artisans Market, please contact Travis Hester (travishdc@delrayfarms.org) or Nick Partee (nickdeuva@gmail.com). To help clean-up 4MR Park where the market will be located, just show up this Saturday at 10am at 4109 Mt Vernon Ave! Nick - It's amazing what has happened in Arlandria in just the past year. Just goes to show what a difference concerned citizens can make.